First of all, BIG thanks to Michael Roberts for the photography work. I highly recommend his services as a photographer, up and coming brewer, and overall great guy. 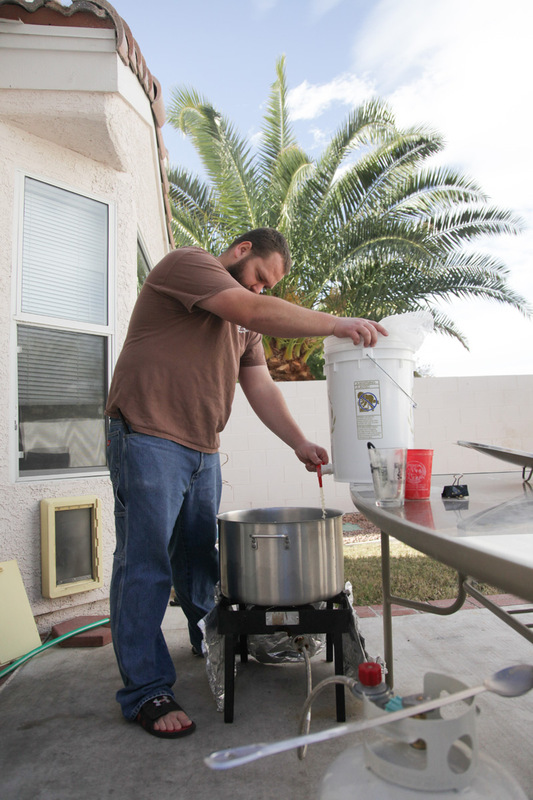 The following is a fairly typical brewday (on 12/3/13) with pictures and detailed explanation. I will do my best to update when my process changes due to new equipment or picking up new information. The first thing I need is an idea for what I want to brew. The rest flows from that first decision. I get ideas from a lot of different places. Sometimes it’s a commercial beer I’ve tried, a Brewing Network podcast, the desire to win an award in a specific category, etc. Once I have the idea, I’ll usually use the new book, Water, to figure out what water profile I’ll be building from scratch (also known as RO water) and I’ll often model my IBU numbers and grain bill after a recipe from Brewing Classic Styles. (I’ll also go to my local grocery store and get 10 gallons of RO from the water vending machine.) 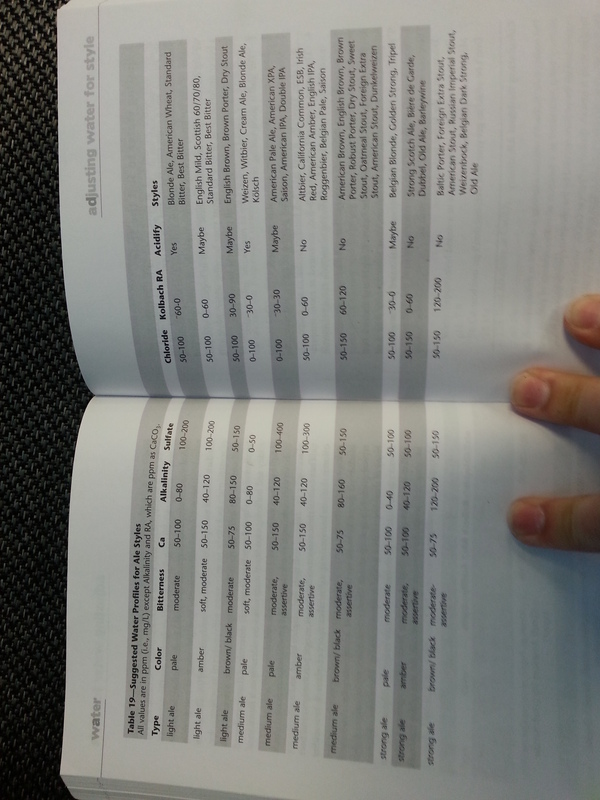 Here are the Water book’s parameters on ales. 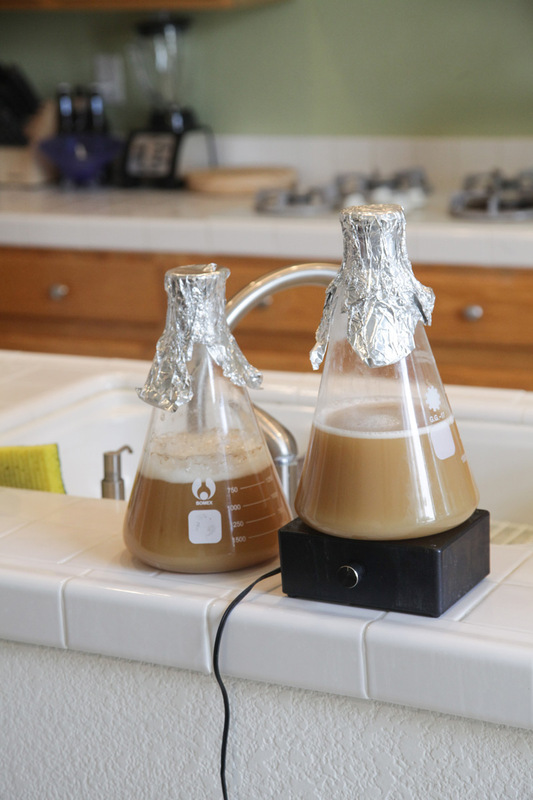 For Citrus Bomb 1 I hatched my own ‘safe play IPA’ water profile using past experience and the Water book. I used EZ Water & Bru N Water to figure out my additions and expected mash pH etc. For Citrus Bomb 2 I used Tasty McDole’s go-to water profile even though it looked a little aggressive and fell out of the Water parameters in places. 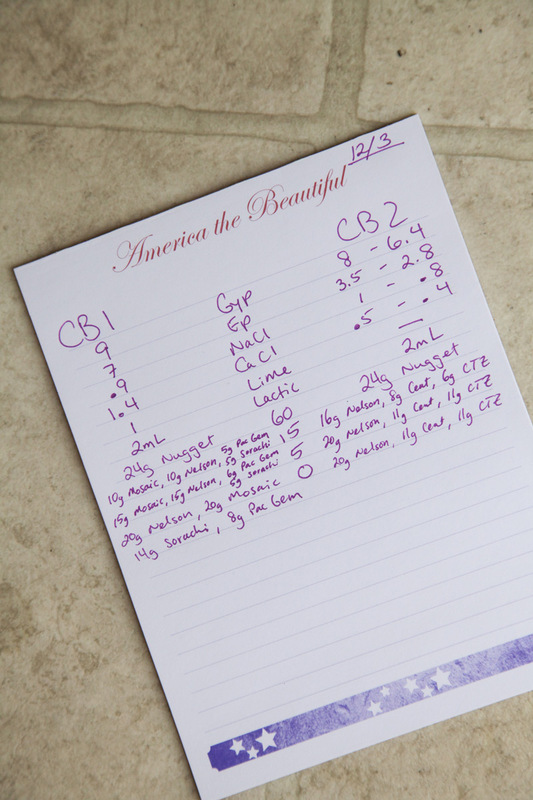 Here’s the recipe for CB2, the beer I brewed directly afterwards. 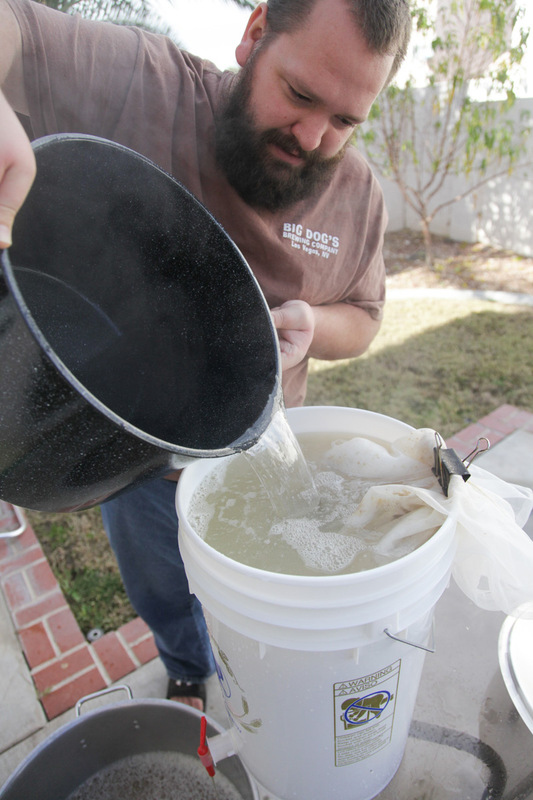 At this point I had a plan, a trusty camera man, and yeast starters ready and rocking. 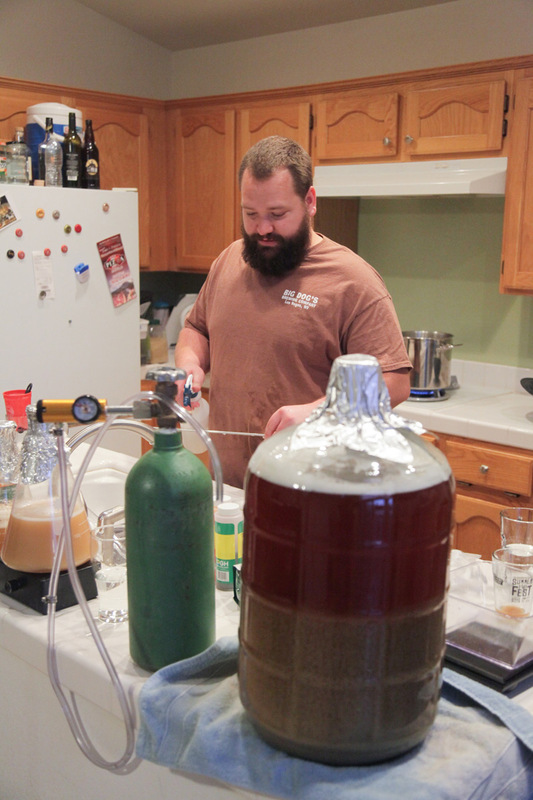 It was time to get busy brewing or get busy dying! First I poured my 5 gallons of Reverse Osmosis (RO) water into my 9.5 gallon pot and fired up my propane burner. I added my 2 mL of lactic acid before the water got too hot, because I’ve heard heat can ‘flash off’ acids. I can’t stress enough how critical it is to wear protective footwear like my heavy duty Under Armour slippers. While my water was heating to strike temperature I measured out my salts I’d be using and put them all in a plastic cup. I usually add those directly to the mash. 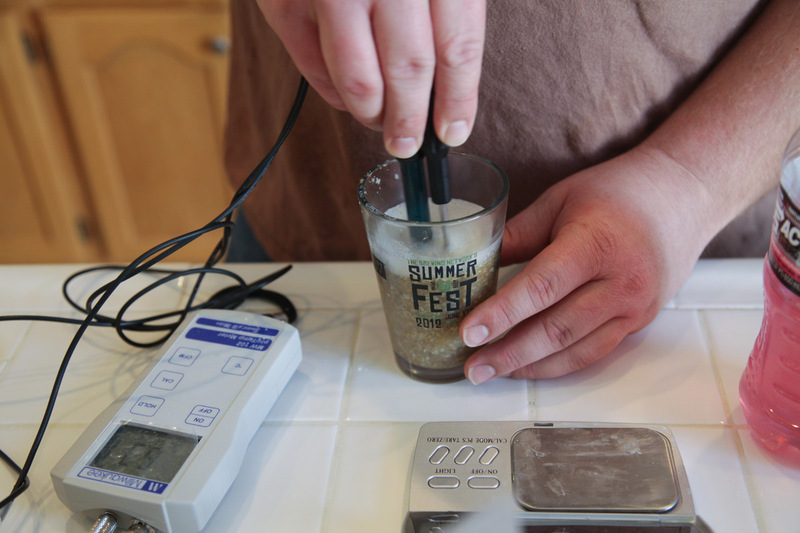 Once I hit my strike temperature (usually around 5-7 degrees higher than my desired mash temp), I poured in my grain. Once my grains were stirred in well, I added my salts. For this brew that mix ended up being 8.98 g Gypsum, 7.31 g Epsom, 0.92 g Canning Salt, 1.5 g Calcium Chloride, and 1.01 g Pickling Lime. I try to make sure I record how much I actually end up dumping in and not just what I was shooting for. 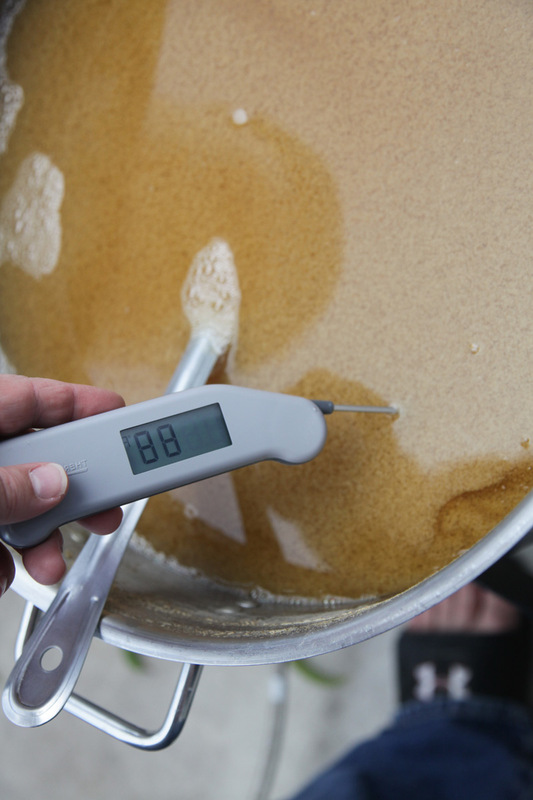 After my mash was all stirred in and salted up, I measured the temperature with my Thermapen to see where I was at. I usually aim for coming in a little low because my mash can be directly heated. 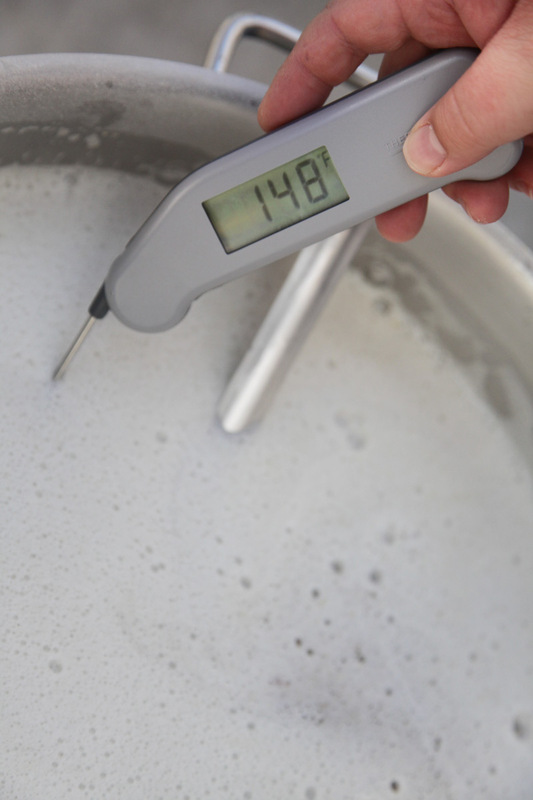 I was indeed 4 degrees lower than my target of 152, so I carefully heated the mash up to 152. At that point I covered it and set an alarm to go off in 15 minutes. Being a big Philadelphia Eagles fan is not a must for this step, but it’s helpful. Because the reactions in the mash can take up to 15 minutes to do their thing, I uncovered after 15 minutes and took a sample. After a little cooling in the freezer, I measured the pH with my fancy pH meter. The mash pH was 5.52. A touch high compared to many of my lighter brews lately, but right in the 5.4-5.6 range that EZ Water recommends. 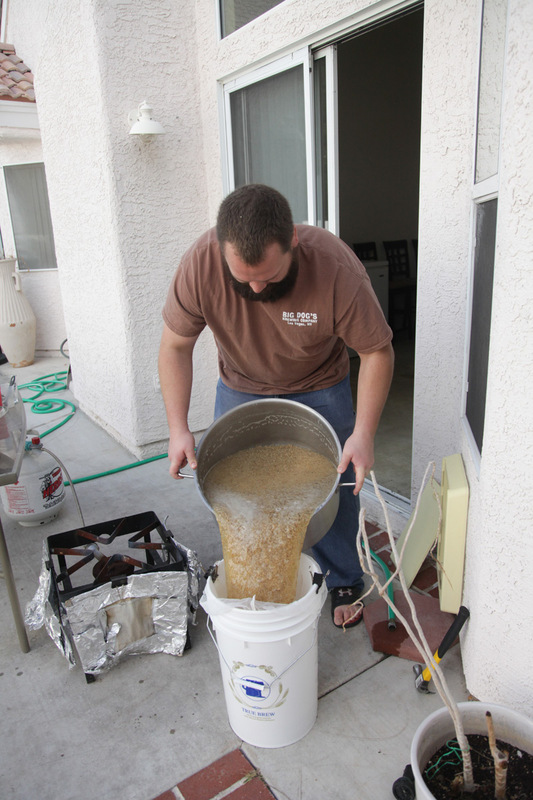 After taking the sample I re-covered the mash and let it sit for roughly another 45 mintues. If the temperature had fallen in the first 15 minutes, I would have taken that opportunity to carefully heat the mash back up to 152. Sixty minutes of mashing later, I started slowly heating towards 170 (my mash out temperature). I find that mashing out tends to get me better efficiency and I figure taking 15+ minutes to get there can’t hurt. I covered the pot for 10-15 minutes once at mash out (168-172). With mash out complete, I confidently poured the entire mash into a bottling bucket with a large strainer bag clipped to the inside. After I dumped my mash into the bottling bucket, I cleaned up my pot so it could magically transform into my brew kettle. 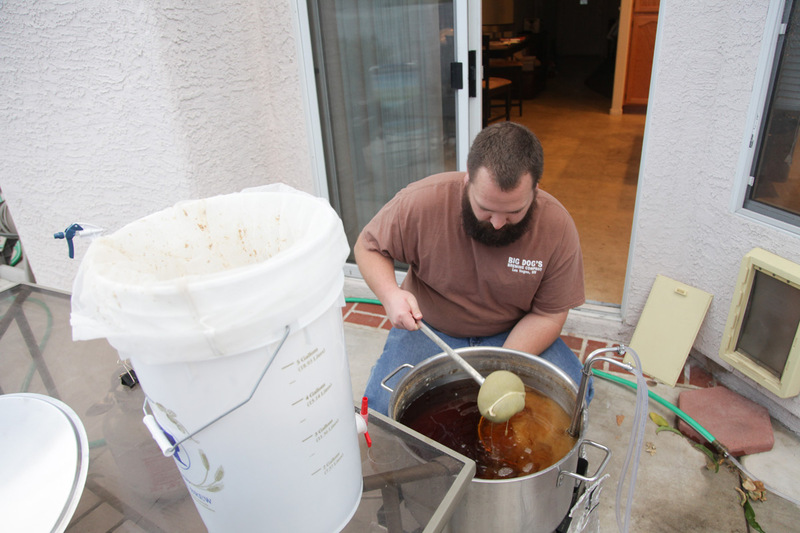 After reading this Fly vs Batch Sparging info, I’ve started doing a poor man’s vorlauf before I truly start sparging. All that means is I collect the runoff from the bucket and dump it back over top a couple times before I let it flow for real. I used 4 gallons of RO water to sparge for this batch. I had it heated up on the stove inside to the low 170s. I poured it over the mash as the liquid level dropped. Once again, dealing with very hot liquids is no joke. Get a protective brewer’s beard and comfortable slippers. The nice thing about this method is I don’t worry about getting a ‘stuck mash’. If the flow slows from the bottling bucket, I lift the bag and rotate it a little and it’s back to flowing nicely. 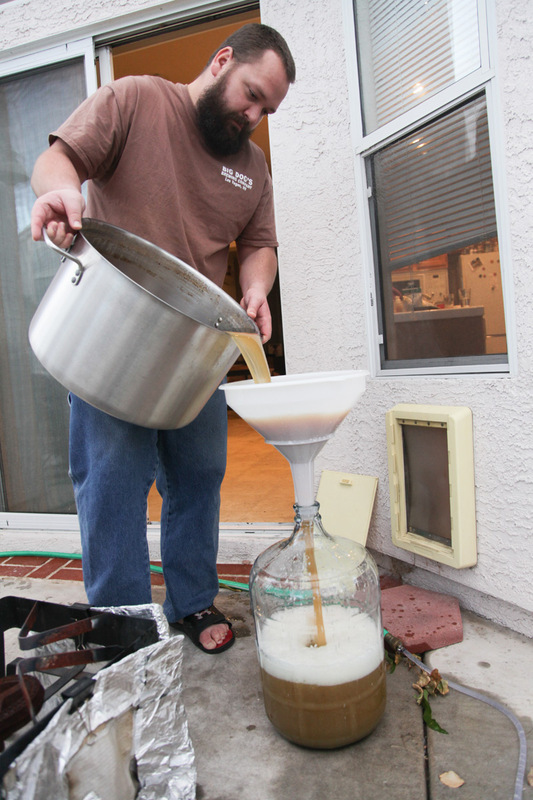 Once I was at my desired pre-boil volume I took a sample to measure specific gravity and pH. I studied the sample and pondered the meaning of life. 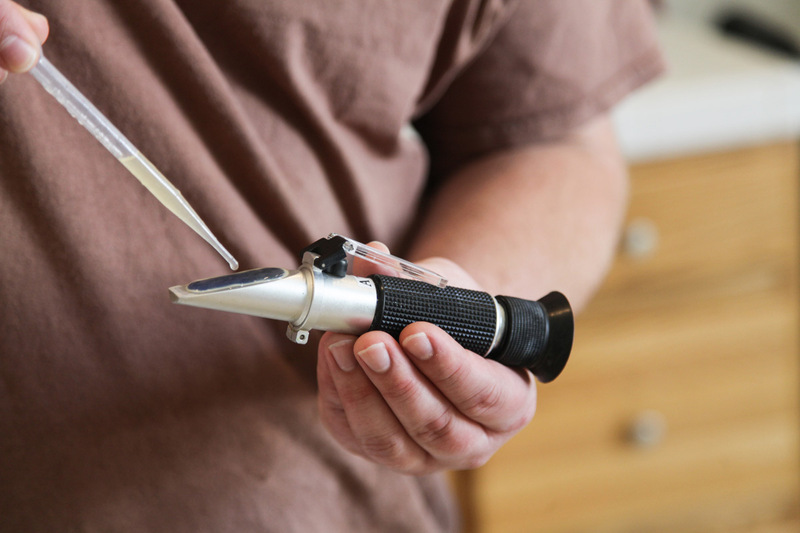 I took the gravity by using a pipette to sprinkle a few drops on my refractometer. 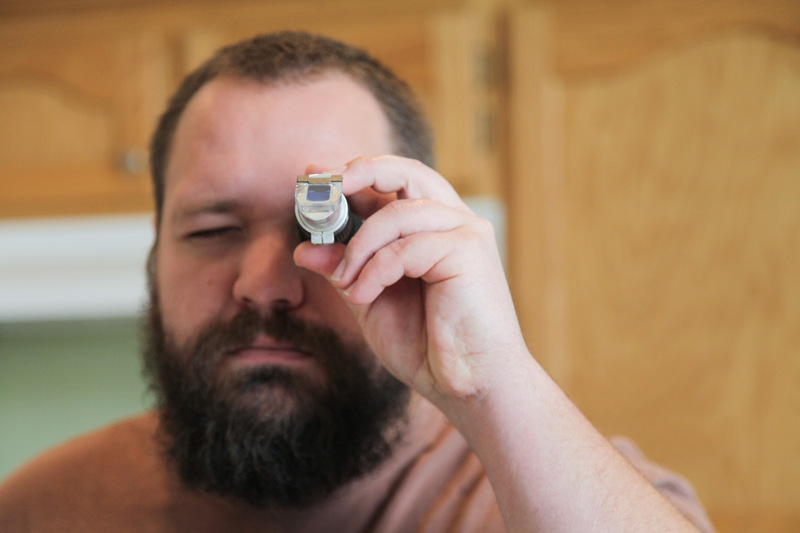 My refractometer told me my sample was 12 Brix which was about dead on what BeerSmith said I was shooting for. It didn’t tell me how to stop looking like I’d lost my razor or how to find my volleyball companion, Wilson. 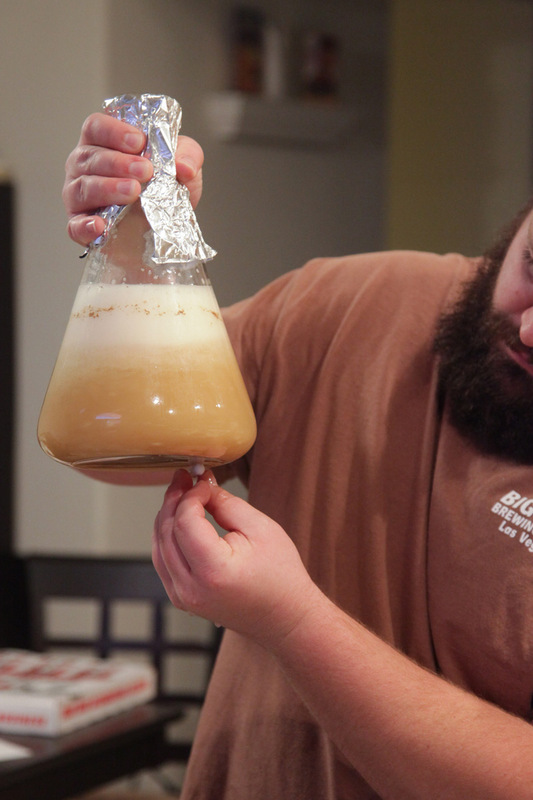 I’ve found knowing my pre-boil gravity to be a very wonderful thing. I never used to measure it, but knowing where you’re at at this juncture gives you much more flexibility in making the beer you want. If my gravity is too high I can add a little more water. If it is too low I can boil longer or add some sort of sugar or dry malt extract. Especially in a style like IPA, where adding corn sugar is pretty common, I might throw in a half pound or so if I get less from my mash than I was expecting. 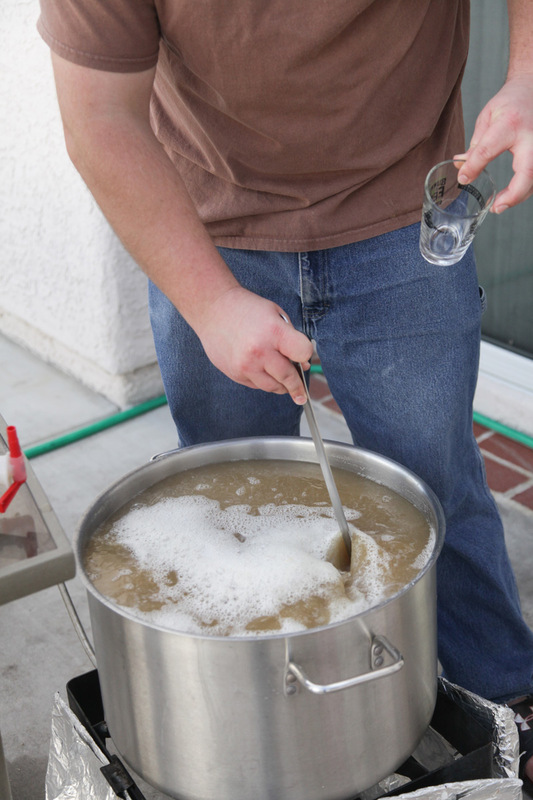 Anyway, my beer was in great shape and on its way to boiling. 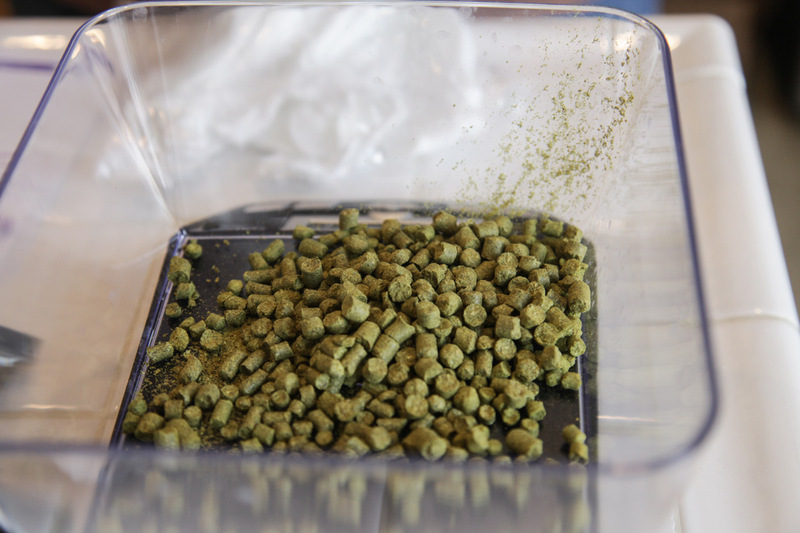 That gave me the perfect downtime to weigh out my hops and have them ready in hop bags. Wilson was still nowhere to be found. Once my boil got going and I had my protein break (that gunky ring on top), I started the timer. I was doing a 90 minute boil even though my hop additions started with 60 minutes left in the boil. I’ve grown accustomed to doing 90 minute boils on all of my beers because I brew frequently with high percentages of Pilsner malt. In those beers you want to really make sure you drive off all of the pre-cursors to DMS (an off-flavor that tastes like cooked corn). 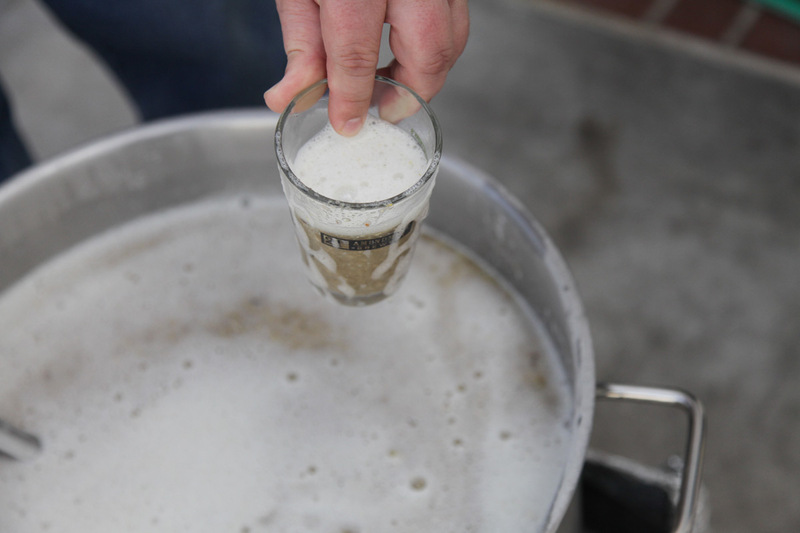 This beer had a little Pilsner malt, but I’m sure I could have gotten away with a 60 minute boil. 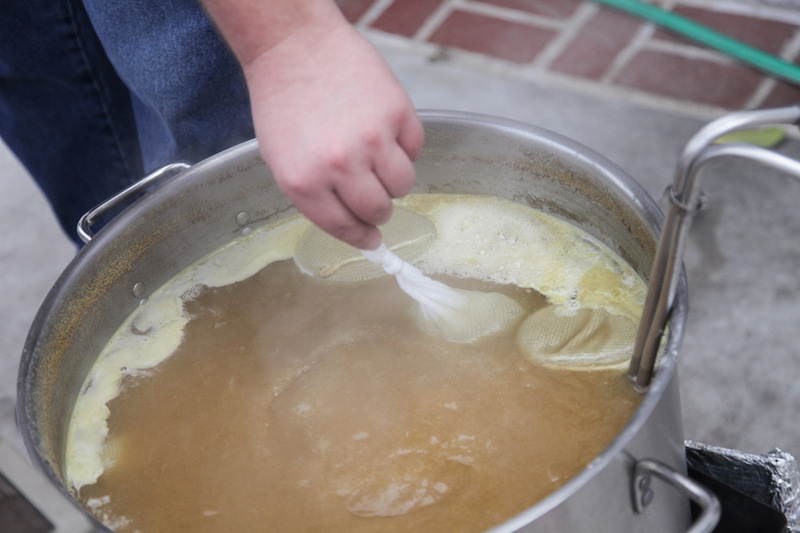 For this recipe I added hops with 60, 15, 5, & 0 minutes left in the boil. 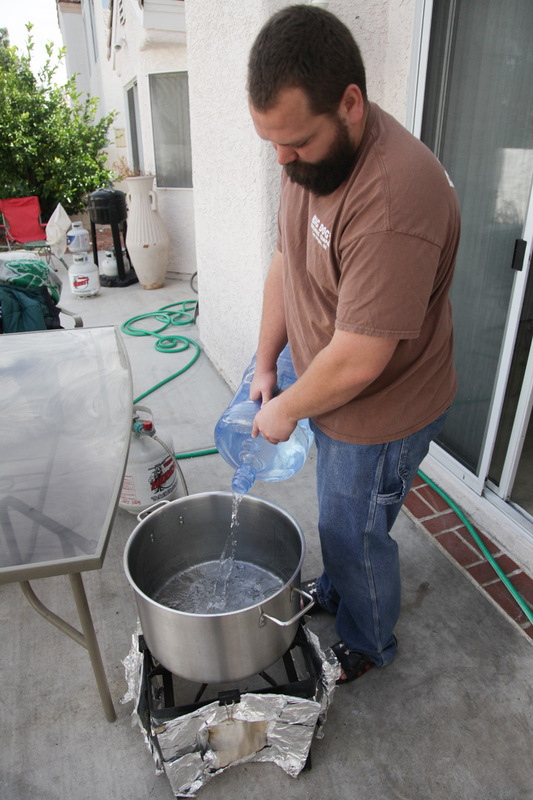 I put the wort chiller in with 10 minutes left to make sure it was sanitized. I added the Demerara sugar, whirlfloc, & yeast nutrient with 5 minutes left. I’ve started letting my hoppy beers steep (while covered) for 30-60 mins before chilling recently based on things I’ve heard on The Brewing Network. I left this beer covered for 30 minutes before turning on the water to the wort chiller. 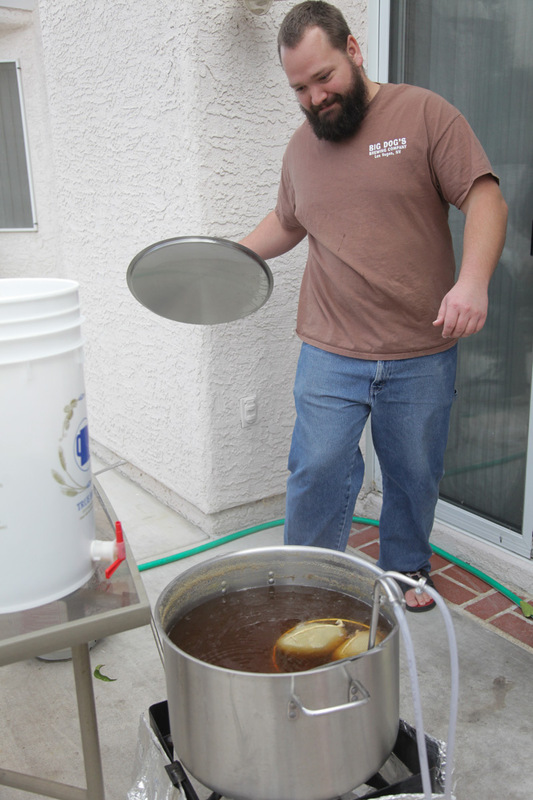 I believe I was demonstrating the quick removal of the lid to keep any possible DMS that may have collected on the lid from dripping back into the wort. Either that or I was pretending I was Captain America with a tiny shield. Possibly both. After 30 minutes of steeping, I was watering the lawn nicely with the outflow from my chiller. 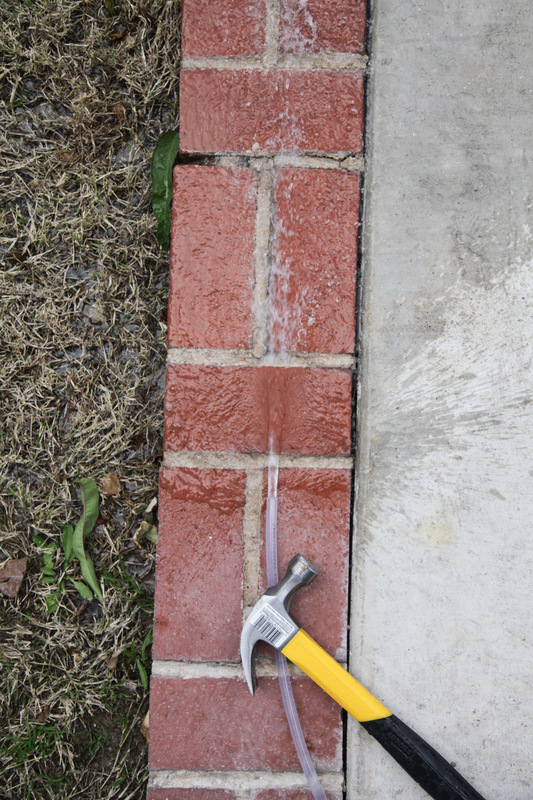 Also, if I had a hammer I would use it to hold down the outflow hose from said chiller. After I was done swinging it in the morning of course. I monitored the temperature to make sure I was in the high 60s to low 70s. I wasn’t yet. 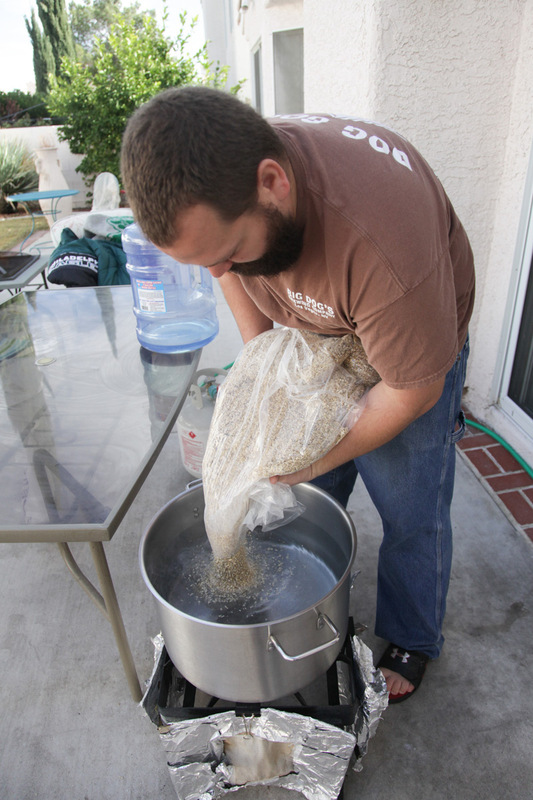 Once it cooled, I fished out the hop bags. 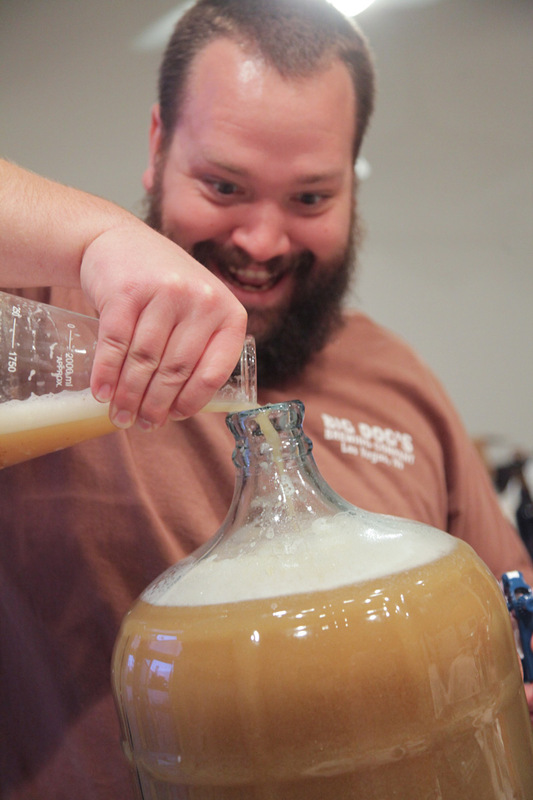 I also took another wort sample to measure the post-boil gravity. We don’t have any pictures of that sampling cause that ain’t gangsta. 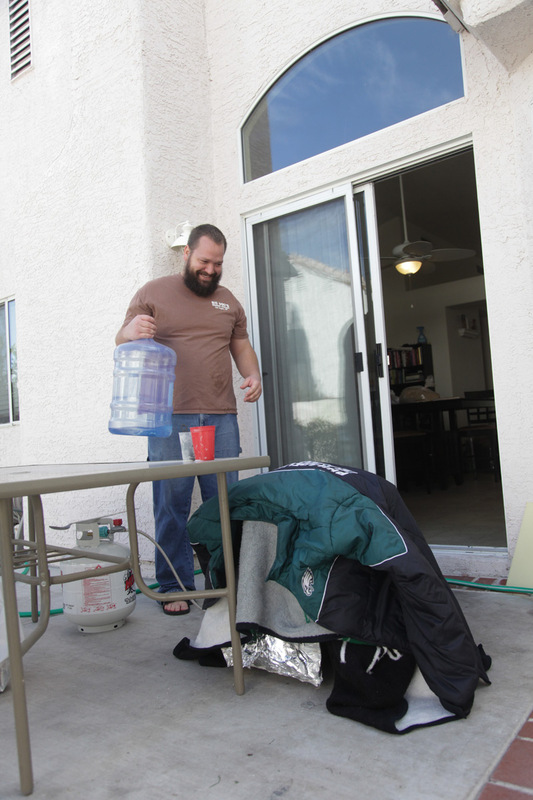 With hops fished out and the original gravity measured at 16.5 Brix (1.068 SG) I was ready to put my beer in the carboy. 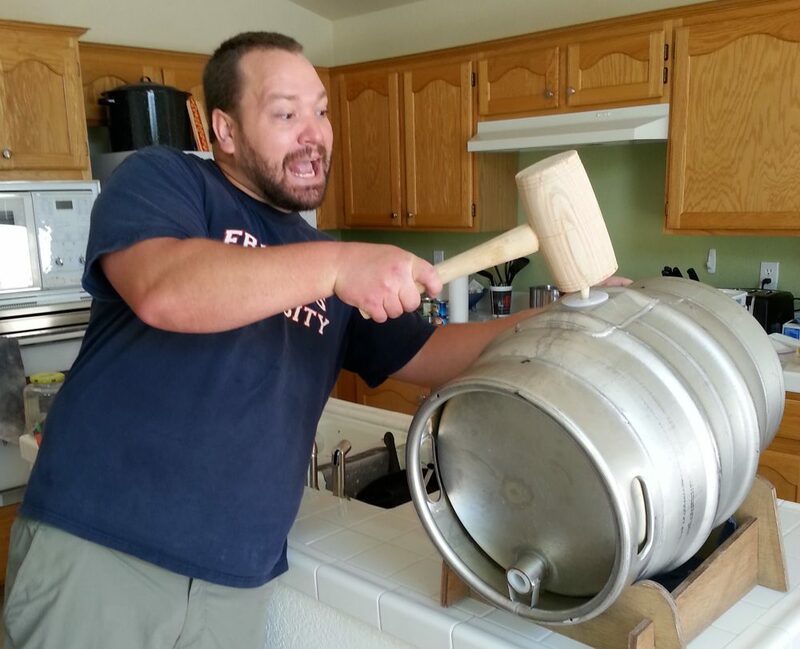 At this juncture I should mention that better brewers than I have spigots on their pots and don’t dump the beer through a precariously balanced funnel. Especially when that added aeration is somewhat moot due to their fancy oxygenation kits. All that aside, I got my aeration equipment ready by boiling my stone and then spraying it down with Star San. 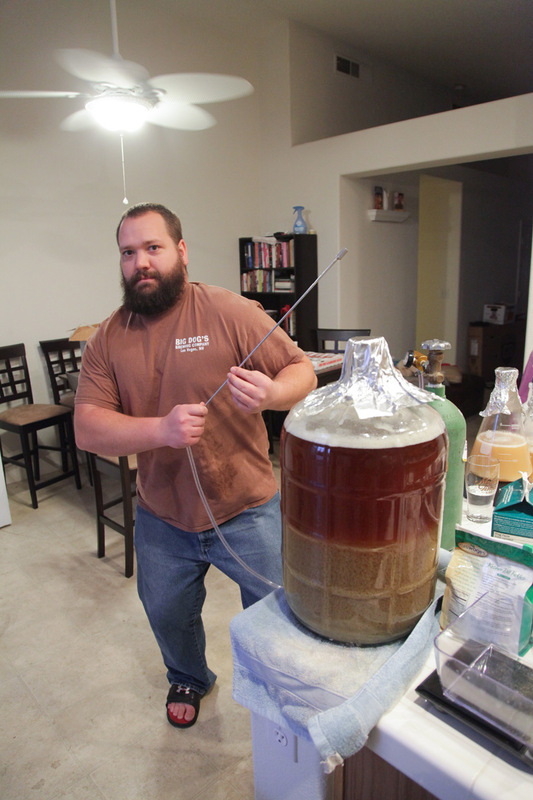 The contents of the carboy look crazier than they should. That’s just the whirlfloc with all the coagulated proteins and hops settling to the bottom. Once again, doing a whirlpool and a spigot would help a smarter brewer than I immensely. Anyway, I proceeded to prepare to oxygenate. I think Mike & I must have sampled a few of my previous brews at this point. 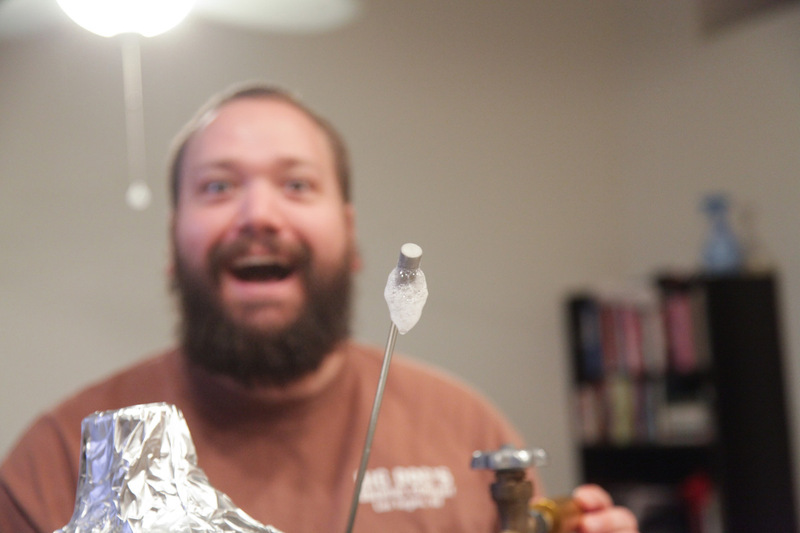 Regardless, I hit the wort with 60 seconds of Oxygen at the “1/8” setting on my regulator. Some places advise 60 secs per 5 gallons while others advise 90 secs on that setting, so I’ll probably need to look into it more. With the wort oxygenated, it was time to dump in my yeast starter. I really really hadn’t planned on using a 5 gallon carboy. Don’t try this at home unless you pretend to know what you’re doing. 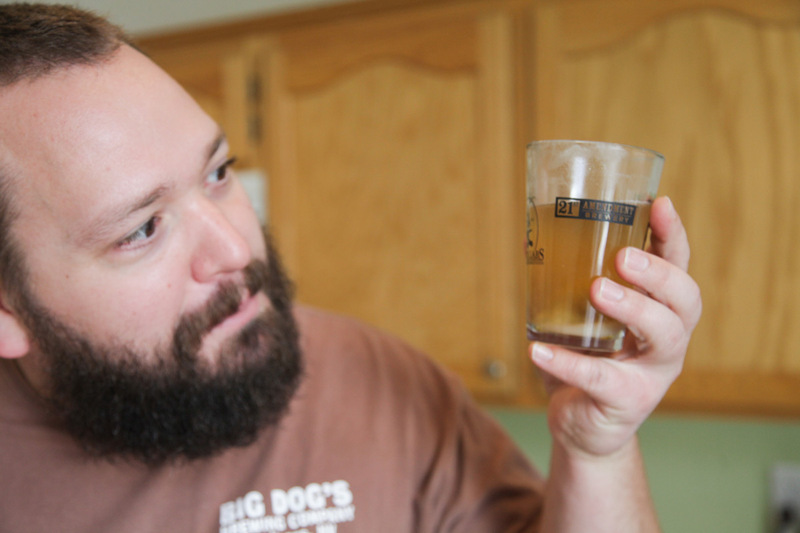 Again, I know my brewer’s beard will protect me from most brew-related evil, so I can roll the dice. 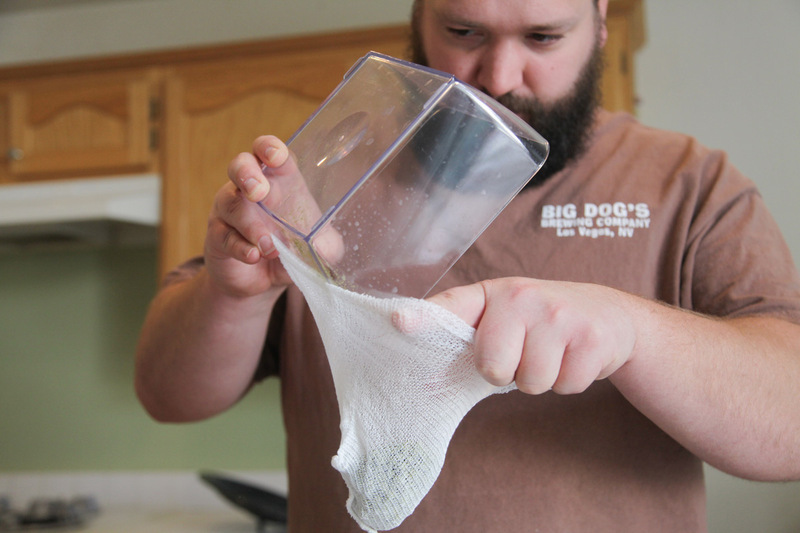 Also, here’s a handy trick to keep from dumping your stir bar into the carboy. Put something magnetic (like another stir bar) on the bottom to hold it in place. 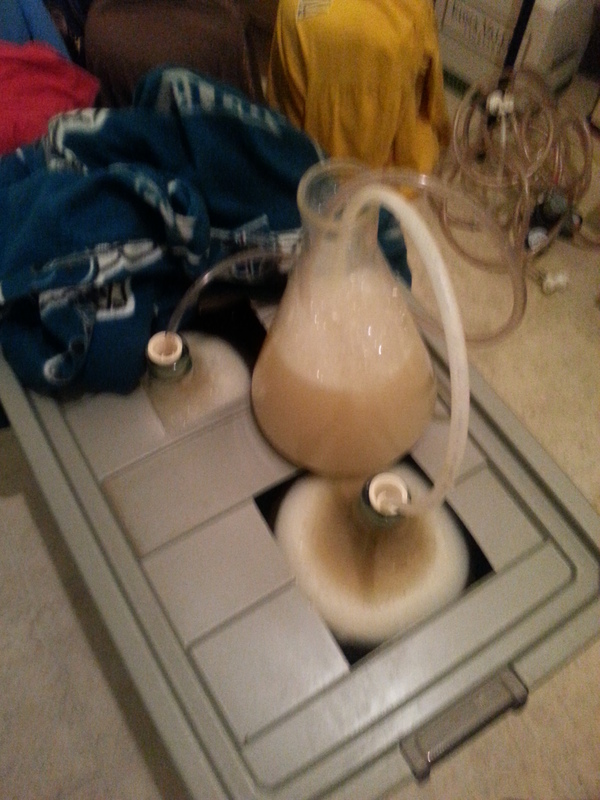 I’m happy to report I ‘got away with’ such foolishly filled primary fermentors. 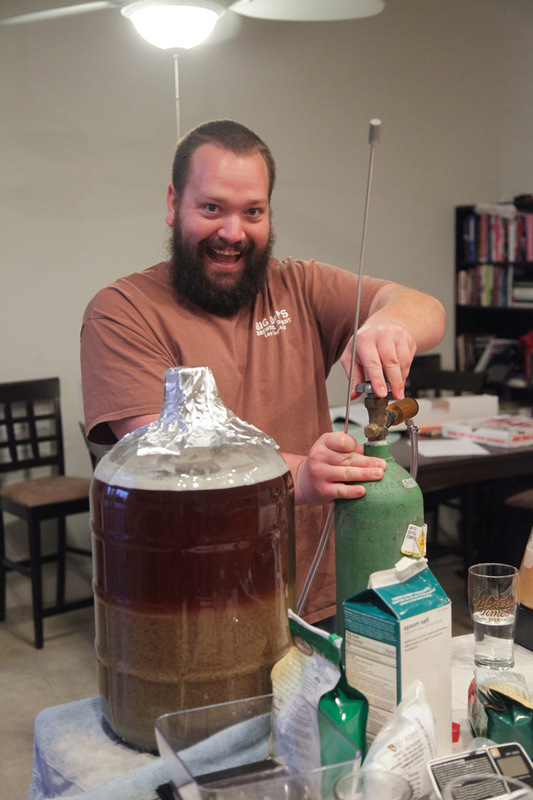 That’s 1/4″ tubing coming out of the stoppers into a 5L flask full of Star San. 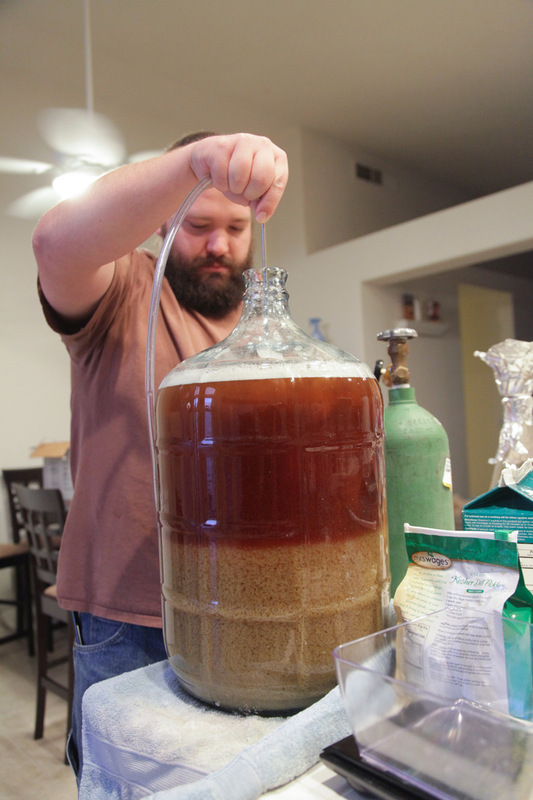 The picture is blurry because Mike didn’t stay at my house for 3 days to capture all the magic of fermentation as well. No dedication at all. Although I’m not sure why I was jumping up and down while taking that picture. I will report back on overall beer quality of both IPAs brewed that day. I just hit them both with their first round of dry hops last night (7 days in). If you have any questions or for that matter suggestions on how to improve my process, please feel free to email me at grantheuer at gmail dot com. I guess I did that so some bot won’t start sending me spam. I’m not really sure.